Photograph courtesy of Frank Eggebrecht, via Friedrich Diestelkamp. The name ANITA, stands variously for "A New Inspiration To Arithmetic" and "A New Inspiration To Accounting". This became the family name for all the Bell Punch electronic models, which were distributed by Sumlock Anita Ltd. The photographs show the machine with model/serial number C/VII/0510/A. The ANITA Mk VII is a full-keyboard calculator with a 13-digit "Nixie" type tube display, and makes extensive use of cold-cathode vacuum tubes, and an "integrated circuit" of the vacuum tube era - the Dekatron decimal counter tube (see photographs below). The Mk VII model was sold mainly in continental Europe, especially Germany, Holland, and Belgium. The manufacturer, the Bell Punch Company, had previously specialised in full-keyboard, "Comptometer"-type, mechanical calculators. The early ANITAs use similar full-keyboards and work in a similar way to a Comptometer since just pressing one of the number keys of the main keyboard immediately adds that number to the total being displayed - it is not necessary to press any = key. Addition is very fast since all the fingers can be used to press keys in different columns simultaneously. The full keyboard and instantaneous display of the result means that for addition this type of machine can be much faster than a 10-key calculator, as explained on the Comptometer page. For multiplication the X key is pressed, the first number is entered on the main keyboard and the second number is entered in the column of keys on the right. The column of keys on the far left are the "tabulator keys". Pressing one of these moves the number being displayed so that its decimal point is in the selected position. For example, assume that as a result of previous calculations the display shows 1.53 on the far right of the display, with the decimal point in position 2 between the 2nd and 3rd number indicator tubes. Now, if the next step in the calculation is to add 0.2368 then we cannot do this since the 6 and the 8 are off the keyboard and display to the right. In this case, with the 1.53 being displayed, the tabulator key marked "4" is pressed and the whole number moves on the display to put the decimal point in position 4 so that the display will show 1.5300. The second number, 0.2368, and now be added with no loss of accuracy. Initially this model used several Dekatron counter tubes. One produced a series of pulses for continuously scanning the number keys on the keyboard. Another was used to position the decimal point in the display and alter its position during multiplication and division. This Dekatron stayed in a fixed state, illuminating one of the decimal point indicators for extended periods which caused problems with sputtering of metal from the energised electrode. The circuit was soon modified to eliminate this Dekatron and cure this problem. In June 1963 the German journal 'Büromaschinen-Mechaniker' announced that the Mk VII would be replaced by the ANITA Mk 8, as sold elsewhere. Photograph courtesy of Hans Bloemen. With the keyboard hinged up to the right the electronics inside is revealed. 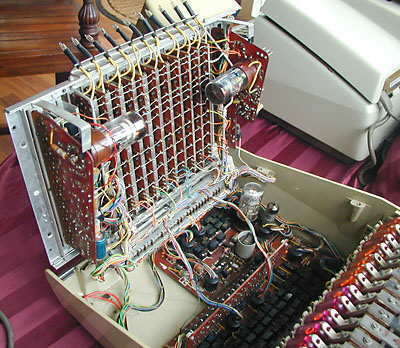 This Mk VII has three Dekatrons, two mounted underneath the keyboard and one on the vircuit board at the bottom. The row of small lamps sticking up from the edge of the keyboard are used to provide the decimal point. Close-up showing the Dekatron decimal counter tube used to produce pulses for scanning the number keys and a vacuum tube to its right. 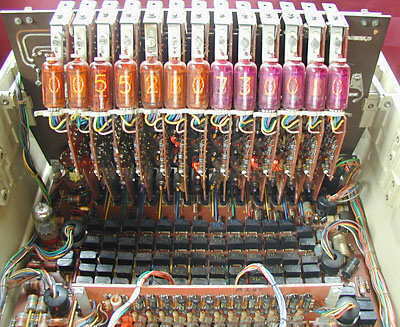 Inside the ANITA Mk VII with the keyboard raised, showing the 13 "Nixie" type number display tubes, each on a separate counter board. Close up with the machine powered up and numbers being displayed. A prototype machine, with covers removed is on display in the Science Museum, London. The ANITA Mk VII is a bit of an enigma. It appears to have been sold only in continental Europe. Elsewhere the ANITA Mk 8 appears to have been the model that was marketed. If you have any information about the ANITA Mk VII please contact us. This and the ANITA Mk 8 were the world's first desktop electronic calculators, and had a monopoly for 2 1/2 years, until 1964 when the transistorised Friden 130, IME 84, and Sharp Compet CS10A were introduced. In this time several tens of thousands of ANITAs were sold world-wide. For a brief history of the Bell Punch Company and the Anita calculators see the article on this site "ANITA: the world's first electronic desktop calculator - A brief history of the complex Bell Punch company and its calculators". "'Anita' der erste tragbare elektronische Rechenautomat", Der Büromaschinen Mechaniker, Nov 1961, p207. "Messe-Berichte: Anita-Rechenautomaten", Der Büromaschinen Mechaniker, Jun 1963, p106.